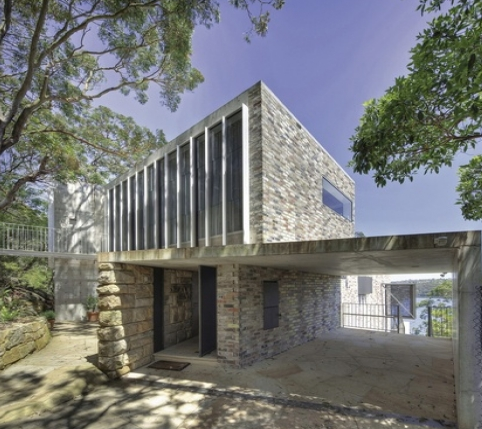 This house, situated on the edge of a steep escarpment overlooking Sugarloaf Bay at Middle Harbour, in Sydney’s northern suburbs, is considered to be one of Neeson Murcutt Architects’ finest works. It is the last house that Murcutt saw completed before his death. 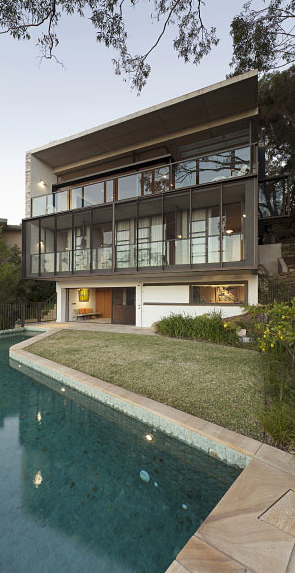 Its location is impressive, on the side of a ridge of the Castlecrag Peninsula. The site is fairly narrow but holds three distinctive and enviable features – a sandstone outcrop which shields the house from the street, an adjacent agophoras bush reserve and picturesque water views. The Chicago school architects Walter and Marion Griffin are best known for their collaborative design for Australia’s national capital, Canberra, which was announced as the winner of the international competition on 23 May 1912. Few of their ambitions for Canberra were realised and their most significant urban landscape design and buildings was achieved in the Willoughby suburb of Castlecrag. In Castlecrag the Griffins are celebrated for their contributions to the suburb’s development, including the street layout, the reserves and pathways, and the accessible waterfront. They set out to demonstrate that architecture and landscape should be integrated so that: ‘… each individual can feel that the whole of the landscape is his. No fences, no boundaries, no red roofs to spoil the Australian landscape; these are some of the features that will distinguish Castlecrag’. 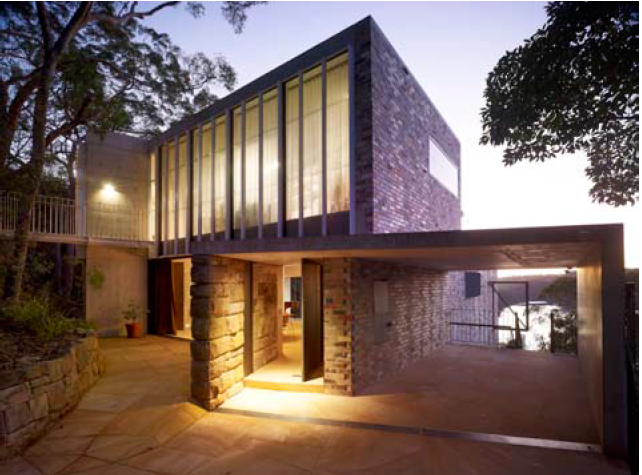 Many references to the historical association significance of the site are made in the design such as the fifty-millimetre-thick crazy sandstone paving links to the sandstone cliff face, the pattern of recycled bricks on the external surfaces reflects the Angophora forest and the fact that the house plan works with the important elements of the surrounding landscape. In an interview with Houses editor Katelin Butler, the architect mentions that there is “literally a little piece of Griffin” in the house, a salvaged piece of sculpted sandstone from a Griffin building found by the owner during the design process. Click here to learn more about these influential architects. Designed as a family home, the house is arranged over four levels stepping down the long and narrow site. 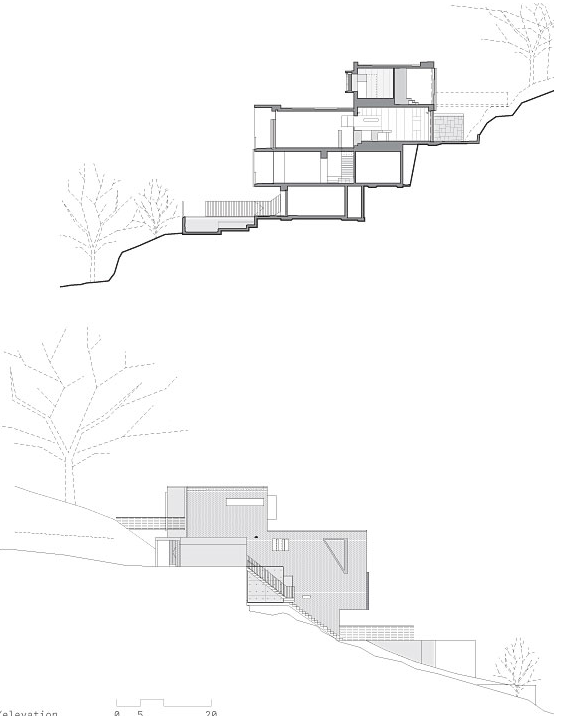 The outer, side walls reflect the width of the old house while the interior spaces rotate towards the rock outcrop, guided by the natural contours of the site. The result as the Architects explains it is “ a pinwheel plan – room to the rock, room to the bush, room to the view – with shifts occurring at each level”. The parent’s bedroom and studio is on the top level, living spaces on the mid entry level and the kid’s retreat on the bottom floor. A level below this has been created by the steep block and hosts a guestroom and facilities for the pool in the lower garden level. The top level connects via a steel bridge to the rock outcrop. Entry to the house is down a pathway leading to an open carport that frames a view to the water below; a feature Griffin would have appreciated. As you enter through the steel pivoting door you step into a kitchen and dining area, remarkable for its concrete ceiling and deep, structural beams that introduce an intimate almost cave-like quality. The expressed beams are rounded to keep the eye moving across the ceiling, creating a sense of rotation, around a pinwheel. A structural wall of concrete supports a white-painted steel stair on one side, and helps enclose a small family area on the other. It is here that the house’s original fireplace and simple timber mantle have been retained and restored. The main materials that have been used include In-situ concrete, brick and sandstone. The two main external walls are of twice re-cycled bricks (the first house was built of recycled bricks due to a lack of building materials in the period following the Second World War, and many of the same bricks have been re-used here). Sandstone, new and recycled, is used in parts both as an external paving and internal flooring, as well as for some walls. 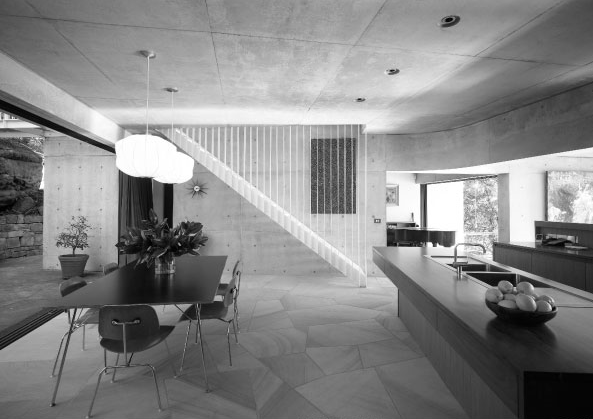 Fairfaced concrete, employed as exposed floor plates, massive structural beams left revealed and structural walls gives the house much of its power and warmth. Fabric curtains and timber add another softer layer. This is an interesting example as the original building was not located within a conservation or heritage area. However particular components of the existing house were retained partly for their capacity to remind. Elements such as the chimney and surrounding fireplace joinery were carefully protected during construction. The marrying of ‘new’ and old brickwork is left exposed to view. A sandstone wall from a flat under the original house has been restored and retained, along with kitchen joinery from the house. This “capacity to remind” extends to the north face of the house where bands of yellow bricks are laid in vertical patterns, a reminder of shadows cast onto the original wall by tall angophoras long since removed from the site. The owners requested that the approach be taken a considered way rather than it “being token referencing to the past.” In addition to many components of the original house being recycled, subtle references were made to the original plan, such as the scale of spaces. 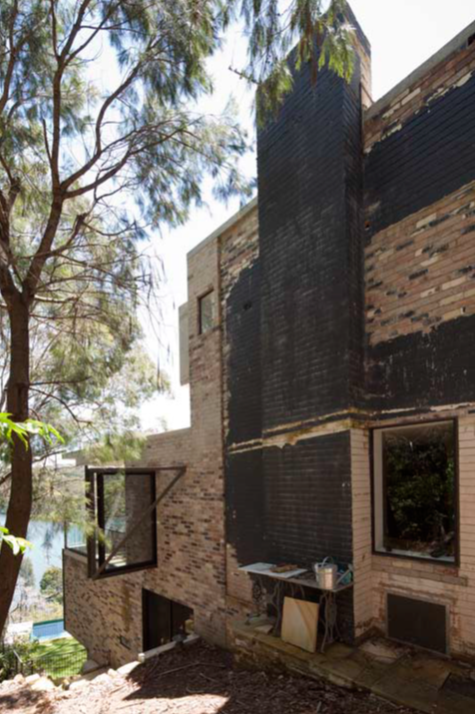 'Castlecrag House, Castlecrag, Sydney, Neeson Murcutt Architects', C+A, Issue 16, http://www.ccaa.com.au/sub/cplusa/articles/issue/16/castlecrag-house/; Katelin Butler, 'Boyd meets Neeson Murcutt at Our Houses' , http://architectureau.com/articles/our-houses-castlecrag-house/, 23/3/2012.